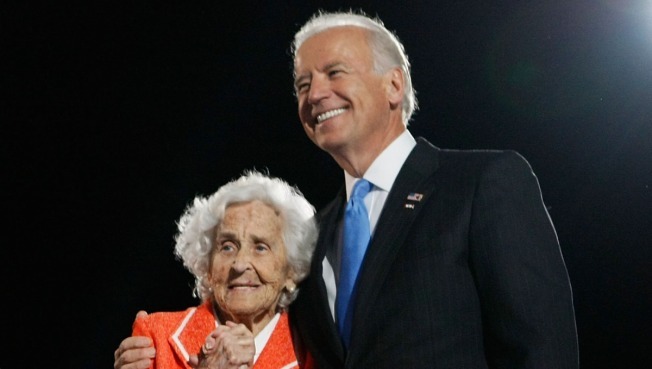 The Vice President's mother, Jean Biden, 91, was injured in a fall at her home in Delaware Sunday. The Vice President's mother, Jean Biden, 91, was injured in a fall at her home in Delaware Sunday, according to White House officials. Jean, whose full name is Catherine Eugenia "Jean" Biden, was taken to the Hospital of the University of Pennsylvania for treatment. Hospital officials confirmed that there is a Secret Service presence at the hospital. She is said to be in "good spirits," according to Joe Biden's spokesperson. Mrs. Biden lives in a guest house on the grounds of Joe Biden's home in Greenville, Del. The Biden family is from Delaware. Jean and her late husband, Joseph Sr., moved their family to Claymont, Del. from Scranton, Pa. when Joe Jr. was 11. She has three other children -- James Brian Biden, Francis W. Biden and Valerie Biden Owens. Joe Biden served as a Senator from Delaware for 36 years, before being elected Vice President.